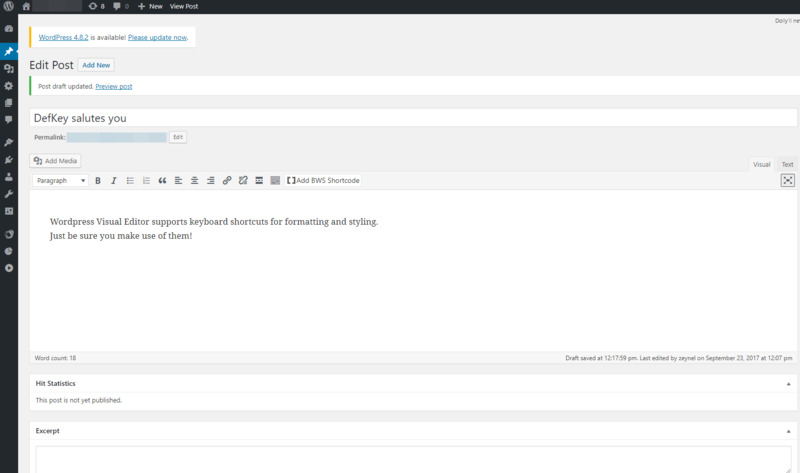 Maybe you didn't realize Wordpress has its own shortcuts, but yes it has! If you have a WordPress site and would like to save some time while writing your posts, these shortcuts will come to your help. These shorcuts work in WordPress' Visual tab. The formatting buttons in this rich text editor works like Microsoft Word's formatting and styling options. On Mac, replace Ctrl with Command key. On Mac, use "Ctrl + Option + letter" instead of "Alt + Shift + letter"
You can also type * or - to start an unordered list. If you get lots of comments for your posts, you can use keyboard shortcuts to quickly approve or unapprove comments. However to use these shortcuts, you need to enable them first. To do this, go to Users > Your Profile and check the Keyboard Shortcuts checkbox. It may take some time to get used to these shortcuts but in long run, they'll speed up the approval process and let you save time. You can select multiple comments by pressing X and moving with J or K keys. When you've selected multiple comments, use shortcuts below to perform batch actions. WordPress is a popular and free blog and content management system. It's open source, customizable and easy to setup. What is your favorite WordPress hotkey? Do you have any useful tips for program? Let other users know below.